One defense for Tavis and Vaisala transducers would be that if they were short of the ability to measure the actual ambient pressures around them, they should have pegged out at the maximum values possible. Under this scenario, the Vikings would have recorded a continuous pressure of 18 mbar, Pathfinder 10 mbar, Phoenix should have stayed pegged on 12 mbar, and MSL should be stuck at 11.5 mbar. This did not happen for the earlier landings, but as discussed above in sections 2.4, it did essentially did happen for MSL on its Sol 370 (August 20-21, 2013) when for Ls 9, the pressure shot up suddenly to 1149 Pa which is 11.49 mbar (essentially 11.5 mbar). See Figures 14A to 14D. Pressures for the previous 5 days in Pa were 839 (Sol 365), 861 (Sol 366), 862 (Sol 367), 863 (Sol 368) and 865 (Sol 369). For Sols 1160 to 1161 at Ls 66 they initially posted pressures higher than the 1150 Pa limit - 1177 Pa on Sol 1160 and 1200) for Sol 1161. Then after we highlighted them, they reduced them to 898 and 898 Pa. Again on Sol 1301 the initial pressure posted was 1154, but when we highlighted it they dropped it back to 752 Pa. See Figures 14E to 14F. Note: Later in this report with Figure 88 we show that the REMS Team resided the pressure range from up to 1,150 Pa up to 1,400 Pa, and in fact on Figure 86 we show that the FMI Abstract originally published in December, 2012 had a pressure range of up to 1,025 hPa/mbar (earth-like). 2.5.1. 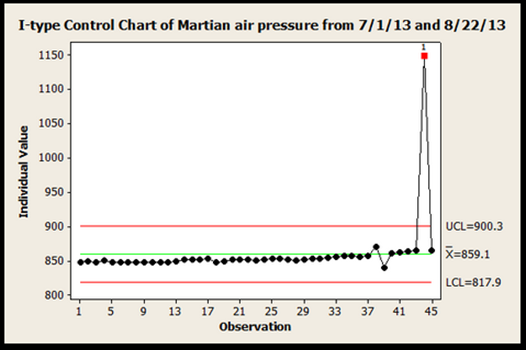 How extraordinary was the (temporary) 1,149 Pa pressure spike of MSL Sol 370? Before we found FMI altering maximum pressure ranges, we focused on the last 45 sols of data and did a quality control Individuals test assuming that each sol was an independent sample of atmospheric pressure (see Figure 13). The upper and lower control limits (UCL and LCL) encompass all data points except for the 44th point which occurred on Aug 21. The standard deviation of this process is 13.7 so that UCL here represents a 3-sigma distance above the 859.1 mean value. Data points within 3-sigma of their mean are considered to be under control and exhibiting normal variation. Any data point exceeding 3-sigma is cause for concern. On a production line, quality control inspectors would be required to explain what went wrong with either the process settings or production line tools. In practice, 3-sigma exceptions are anticipated no more than 6.7 times per hundred measurements while 6-sigma exceptions should occur no more than 3.4 times per million observations. Really large sigma values, should be very, very rare. The Sol 370 measured value of 1149 Pascal is huge, just over 21-sigma from the mean value. Figure 13 above: Quality control Individuals test. Figure 14A above – MSL’s pressure sensor suddenly pegs out at essentially 11.5 mbar. 1,149 Pa = 11.49hPa/11.49 mbar which is as much as the instrument is capable of measuring. This suggests an even higher pressure during Sol 370 because this figure is always an average pressure for the day (meaning that some of the day had to have pressure that exceeded the transducer’s capabilities). However, as I discussed back in section 1, the effort to derive the truth from NASA is not unlike being in a war. When I first wrote this my primary computer was under attack by a virus; but more important is that JPL’s REMS Team, seven months after I highlighted the significance of 1149 Pa, went back to their report and changed its 1149 figure to 865 Pa – right what it was the sols before and after Sol 370. This is shown on Figure 14C. HOWEVER, at least as of November 18, 2015, Ashima Research did not revise their data. As is shown on Figure 14D, they still show 1149 Pa for Sol 370. Why didn’t Ashima (et at. least) revise its report? They were criticized by me on line for less than ethical behavior with respect to MSL data early on, and I published a negative evaluation of their General Circulation Model (GCM). So perhaps they didn’t want to add fuel to the fire. For months I thought that perhaps they simply hadn’t caught up with the changes made by the REMS Team. However as I update this section of my report it’s now (May 22, 2016) over 18 months since Ashima has made any update or revisions to its Mars data at http://marsweather.com/data. In fact that link no longer works and Ashima has apparently gone out of the business of keeping up with constant REMS Team changes in their Martian weather data. 2.5.2 The importance of gleaning data from identification of our web site readers. On January 20, 2016 we caught a Spanish IP address at 161.111.124.7 from the Consejo Superior de Investigacions reviewing the bulk of our Mars weather spreadsheets. On checking we found that they oversee the Centro de Astrobiologia (CAB) in Madrid. The CAB is home of the REMS Team that issues all weather reports for MSL. On the day after this review was caught, very much as we predicted, the REMS Team dropped the pressure for Sol 1160 from 1177 Pa to 899 Pa and for Sol 1161 from 1200 Pa to 898 Pa (See Annex P of this report and our web site at http://marscorrect.com/photo2_28.html). Our research challenges Establishment positions about Martian atmospheric conditions. As such, for purposes of feedback about the quality of our work, it was our standard operating procedure for three years to track and record our web site readers from NASA, the Kremlin, the CAB/REMS Team, and the Finnish Meteorological Institute (FMI), the European Space Agency, Russian aerospace institutions outside of the Kremlin, the Chinese National Space Administration, the Japan Aerospace eXploration Agency (JAXA) and the Indian Space Research Organization. After a while we found that what looked like NASA Ames or the Kremlin was in fact the U.S. Department of Defense. There was no cooperation between our Government and us until word got out via a 3.5 hour TV interview translated into Italian that we were involved with identifying what appears to be primitive life on Mars. The interview is on line at https://www.youtube.com/watch?v=PqCxAErabuU. Some of it is discussed in Section 15.3 of this report and shown on Figures 71 to 73. In February, 2019 we were asked to review new findings and publish our comments about them. By June, 2019 the results will be public along with caveats like, “evidence of life is not proof of life,” but (while we still need DNA-type evidence) we doubt that people will be fooled for long. The evidence is overwhelming. Our findings about Martian wind, given in Section 7 of this Report earned us one of 14 chances to review and vote on publishing what’s up there. As for who is monitoring us now it’s almost all by our Government and intelligence agencies, but not a concern so long as no effort is made to disrupt publication of primitive Martian life that may, in fact, be contamination from Earth. Figure 14B below � The pressure the day before the 1149 Pa (11.49 mbar) spike was 865 Pa (8.65 mbar on Sol 369). After I called JPL about it, the pressure for the next day (Sol 371) returned to a more politically correct 865 Pa again. It is quite possible that MSL hit a rock on Sol 370 which jarred loose a clot at the dust filter, allowing the transducer to feel real ambient pressure for the first time. After I told Guy Webster at JPL that I had captured the report about Sol 370 on a Print Screen image, they may have felt little choice but to show Sol 371 pressures as back to normal. To not do so is to admit that all previous pressures reported were bogus, like their old wind reports that they finally had to change to N/A. Figure 14C below � Sol 370 shows that the REMS Team and JPL approach to problem solving � they simply rewrite history and hope that nobody will notice it. Figure 14D � The REMS Team did not yet succeed in getting Ashima Research to revise history as of August 31, 2015. They still showed the original pressure figure of 1149 Pa (11.49 hPa/mbar). Figure 14E � Again on sols 1160 and 1161 The REMS Team/JPL posted inconsistent pressures that were higher still. The final result? Same as before. They threw out their first reports and gave us pressures on the curve that they wanted us to use. As Figure 14G shows, it’s not just pressures that are revised when they are off the expected curve. The REMS Team originally showed a minimum air temperature of -128° C for Sol 537. The night before this (Sol 536) the low was -83° C, and the night after it (Sol 538) was -85° C. So to make the data fit the curve they revised Sol 537 to show a low of -83° C. Ashima Research took its data directly from REMS, but it didn’t always replicate the changes to data made by the REMS Team. This is demonstrated on Figure 14F. A temperature of -128° C is cold enough for carbon dioxide to freeze,37 but these temperatures are not associated with near equatorial latitudes like that at MSL (4.59° South). See Section 14 for more about MSL temperature measurement problems. Figure 14F - Once again, when record pressures were published for sols 1300 and 1301 and we predicted at http://marscorrect.com/photo2_29.html that they would revise them, they did. The REMS pressure for Sol 1299 was 753 Pa, and for Sol 1302 was 751 Pa. So they revised pressure for Sol 1300 from 945 Pa to 752 Pa and for Sol 1301 from 1154 Pa to 752 Pa. Figure 14G below � REMS also alters temperature data that is off the expected curve. This section continues with Section 2.5.3 here.